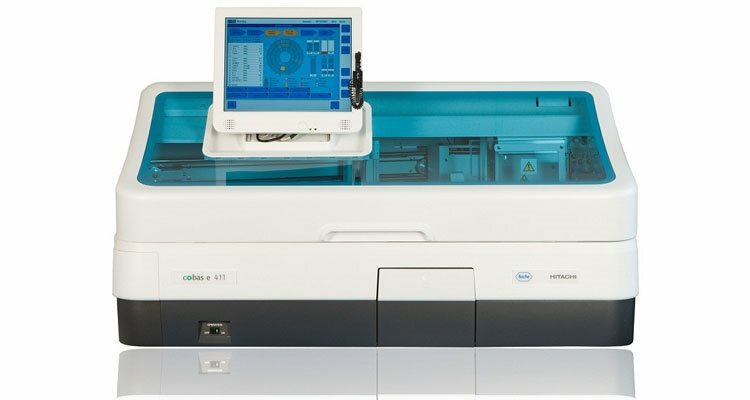 Fully automatic immunological analyzer with a capacity up to 88 t / h.
Needs the shortest time to obtain the final result of all immunological analyzers – between 9 and 18 minutes. This is due to the method of measurement that is ECL, which also allows a wider measurement range, greater sensitivity and needs smaller quantities of serum. Possibility of continuous addition of samples at any moment of the process. Possibility of setting urgent samples under STAT. Unique concept of programming just by inserting the reagents, calibrators, controls and serums into the instrument and its launch. At the start the instrument detects the barcode and starts working. This option increases the efficiency in the laboratory. Wide range of tests of over 75 which cover the 7 different areas of indication. It is desirable to note that, unlike some instruments, there is no need of any selectivity through indication areas by defining the tests. The reagents do not need any preparation (Ready To Use),they are located on the drive with temperature control. During the work at each pipetting the reagents open and close automatically so they are protected from external influences in every moment of the process. This possibility to automatically open and close the reagents and temperature control increases durability of the reagents inserted on on the instrument to 60 days even for the most sensitive tests. Great stability of calibration of the lot has changed significantly reduced costs. In the reliability of the results in every moment of the process despite the increased stability of reagents and calibrations, also contributes the detection level and opening coagulum (Clot Detection). The possibility of transmission and contamination of the sample is reduced to a minimum by using special pipettors for one use only at any pipetting of serum or reagent. This is another fact which increases the reliability of the results. Ability to work with serum, plasma and urine. System software is perfected and standardized with all Cobas platforms. Performance of the PC – is significantly improved compared to the Elecsys 2010. Anyway here are the biggest changes made in respect of the Elecsys 2010 in order to simplify the whole system to the user. For more detailed information about the product specifications and test menu, click here.